Our range of products include box tripod turnstile, full height rotor turnstile, waist high turnstiles, compact turnstile and automatic tripod turnstile. SIO Box Tripod Turnstile is a compact and elegant solution to equip your entrance point; installed in a line several turnstiles form a secure passageway without installation of extra guide barriers. The box turnstile features 2 built-in readers with a Wiegand interface connection with a controller. The Built-in card readers will save you equipment purchase and installation expenses. The turnstile top cover features LED direction indicators with bright pictograms displaying a status of the turnstile, indicating authorized/ not authorized passage direction: green arrow indicates a direction of authorized passage, while stop signal indicates the turnstile is locked and a passage is not allowed. The turnstile is a normally closed unit – stays locked until a passage authorizing signal is received, or the turnstile is unlocked with a mechanical release key. The turnstile can be unlocked by a signal from a fire alarm system. In a case of emergency, the turnstile can be unlocked with a mechanical release key, ensuring free rotation of barrier arms in both directions. The turnstile as standard comes with a mechanical release lock built-in into the turnstile housing and a set of keys. We are offering Full Height Rotor Turnstile to our clients. The robust welded Aluminium structure of the turnstile offers utmost reliability and vandal resistance and ensures the turnstile stable operation even in the harsh environment for many years. The finely structured powder coating with mica iron-effect provides superior corrosion protection, effective electric insulation, and improved impact resistance. It can be operated from the remote control panel included in a standard delivery set or a wireless remote control (optionally) and can be easily integrated into most access control systems. The operating modes are set up independently for each passage direction. We are offering Waist High Turnstiles to our clients. 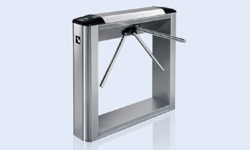 High durability and injury-free operation make the use of the SIO Waist High Rotor Turnstile safe and long-lasting. The electric drive provides smooth, noiseless and inertia-free rotation. Located in the guide barrier posts Red/Green status lights indicate the direction of authorized passage and the turnstile status. Key override control enables mechanical unblocking of the turnstile for free rotation in both directions. If required, the turnstiles can be completed with matching railings. 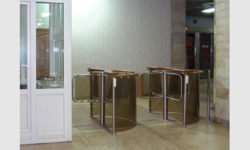 We are offering Compact Turnstile to our clients. 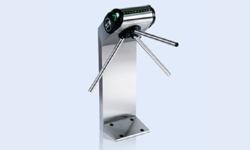 We are offering Automatic Tripod Turnstile to our clients. With its compact design, it can be applied at entrance points of various configurations. 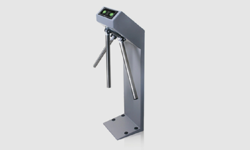 The turnstile performs emergency folding of barrier arms by the remote signal from an access control system or at a power loss. When the power is restored to bring back the folded arm into operating position (blocking the passage) just lift it manually. It can be operated from the remote control panel included in a standard delivery set or a wireless remote control (optionally) and can be easily integrated into most access control systems. As the turnstile can be preset to operate in either pulse or potential control mode, it ensures compatibility with virtually any access control system. An operating mode for locking or opening the turnstile can be independently set for each passage direction. The turnstile comes with built-in optical arm rotation sensors to ensure accurate registration of each passage through the turnstile as well as the passage direction. It is designed with the control logic board installed inside the turnstile housing. After each passage, the barrier arms are automatically returned to home position by a self-centering mechanism. 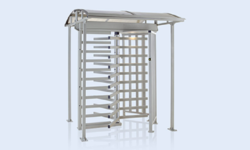 A built-in hydraulic damper makes the turnstile operation smooth and quiet.